Scheduling Ninja – This just sounds so much more fun than medical office receptionist, or front office scheduler. Of course then the office manager would probably be referred to as the Scheduling Sensei…. Another cool job title to aspire to. Rooming Guru – you know that one cool MA that keeps the office running like a well-oiled machine and knows where every patient, doctor, and tongue depressor is at any given time. Laboratory Hero – From finger pokes to blood draws this healthcare worker has it all covered, and can help providers get their results back at the speed of light. Magician of Meds – Conjuring up refills and documenting medications as if by magic. This MA will do everything they can to make sure you never miss a dose. We can go on and but the truth is every healthcare worker is a ninja, guru, rock star, hero, and magician every day, even if their job titles don’t come out and state it. If you are ready to start your own career in healthcare please visit our website at www.allenschool.edu to learn more. Our Masters of Education Readiness (Admission Advisors) can’t wait to help you get started on a rewarding career today. The New Year is just begun, but it’s time to start thinking about YOUR new career in healthcare! Today we look at a few tips from Glass Door to start your 2019 job hunt off on a high note. Get Your Resume In Order – Update your resume and be sure to run it past your Career Services advisor to make sure everything is perfect. Get Your References Set – More importantly make sure they know they are being used as a reference. Don’t let an important phone call come as a surprise. Use Some Vacation Time – Not from class of course… but take time from your daily job if needed and invest in your new career. Polish Your Skills – Practice makes perfect. Research and answer interview questions and again speak to your career services advisor and set up a mock interview. Be Rested and Ready – Especially the day before an interview. Don’t let a late night ruin your chance at a new career. To read more about these great 2019 tips for preparing for an interview please click here. The Allen School of Health Sciences is proud to support an important health related cause every month and we dedicate the month of January to Alzheimer’s Awareness. Alzheimer’s is a form of dementia that affects memory, thinking, and behavior. It is a degenerative disease, which means that symptoms will get worse over time. Alzheimer’s is the most common form of dementia and as of now there is no cure. The Alzheimer’s Association has compiled a list of 10 common signs of early Alzheimer’s disease that can be an indication that someone needs to be assessed for this form of dementia. To read about these symptoms, as well as common age related changes please Click Here. While there currently is no cure for this disease there are still many ways you can help. Memory Care Centers are always in need of volunteers to help work with Alzheimer’s patients and enrich their lives. Family and friends of those caring for an Alzheimer’s patient also need volunteers and support. In addition there are many local organizations in your area that hold fundraisers, host events, and post volunteer opportunities for those who would like to get involved. To find opportunities near you please visit ALZ.org. If you are ready to join an institution who takes learning beyond the classroom please contact us today. Classes are enrolling now for our winter terms. You can visit our website at www.allenschool.edu or give us a call directly at 877-591-8753. Have you been looking for some other resources outside of the classroom to help expand your knowledge on the current state of Medical Assisting field? Whether you are just starting school or already in the field, here are 4 great blogs to keep up to date with what’s happening in the field of medicine as it pertains to the field of Medical Assisting. One of the best resources for medical assistants is the Legal Eye on Medical Assisting blog. The blog articles focus primarily on ethics and the legalities of the profession. Another good resource for medical assistants is the Medical Assistant Career blog. There you will be able to find articles which focus more on the daily tasks of a Medical Assistant. Medical Assistant Resources is geared more towards Medical Assistant students. This blog would be a great resource for someone contemplating becoming a Medical Assistant. The National Healthcareer Association offers a blog featuring information on growth within the Medical Assistant profession. So what are you waiting for? Now is the time to start working towards a new career that may change your whole life in less than a year. Winter classes are enrolling now at all campuses and filling fast. Please visit www.allenschool.edu to learn more and get started today. Welcome to the exciting world of the healthcare field! There are many opportunities for growth and advancement, and with the hundreds of jobs available within the medical field, you’re sure to find one that’s a perfect fit for you!While the office assistant position is vital to the running of any healthcare facility, and many people find success and fulfillment in this job, you may find yourself wondering what else is out there. What other jobs can you qualify for with the experience you’ve gained as an office assistant?Human capital industry website, Payscale.com has a great format for compiling national data on all manner of career tracks. It includes median salary information by job title, plus numbers for bonus, benefits and other things you’d want to know about any given career field. It also shows projected salaries for every job type over time so you can see what you might expect to earn after 5 years, 10 years and beyond in your field of choice. It even shows the differential between what you’d earn in the same career in different US cities.But perhaps the most interesting information shown is the typical career path for any job title. They use a flow chart to demonstrate the typical jobs that a person could grow into after beginning in a given job. 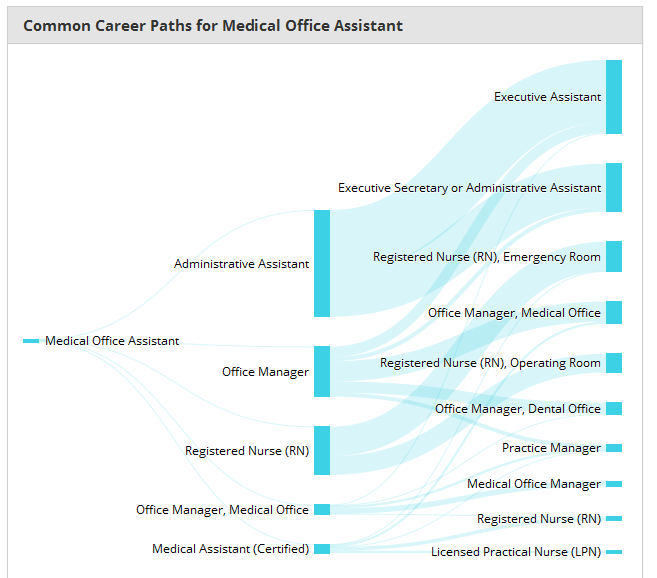 To wit, look at the chart below for medical office assistants to see the commonly occurring evolution of a career that begins with medical office assistant training. Visit the page housing this chart for an interactive version of it as well as all the other great, relevant information you should consider when deciding to embark on a new career via medical office assistant training.The medical office assistant job is incredibly versatile, and the skills you learn from this position can help you advance to many careers, whether you want to remain in an office setting or hope to jump on the floor as a nurse. Below are a few of the career paths you can take if you’re ready to advance your medical career! If your favorite thing about medical office assisting is maintaining order on the business end, consider becoming an office manager! Office managers take care of the administrative details of running a medical facility: re-ordering supplies, and creating and managing budgets, all of which are necessary to ensure the smooth running of the facility and the health and happiness of patients. Because this job is specialized, it requires a little extra training; many office manager positions require an associate’s degree in management, while a bachelor’s degree can earn you a higher salary and work in a more prestigious facility. If you’re excited at the prospect of working directly with patients, then becoming a registered nurse is for you!Registered Nurses are arguably the most important people in any given facility, next to the doctors themselves. They not only gather symptoms and vitals from patients, as well as other more hands-on duties to patient care, but they also act as supervisors to other nurses and medical staff.Because Registered Nurses require so much knowledge in medical and managerial duties, the training is rigorous. Many RNs have bachelor’s degrees in nursing sciences – giving them the skills to work in a variety of clinics – and are required to pass the National Council Licensure Examination. All this schooling ensures that you can handle a variety of patients and settings, which makes RNs very valuable employees. One of the most important departments in any facility is the billing and coding office, and the medical billing manager oversees it.Medical billing managers oversee the billing and coding of every institution the facility is involved with, and manages the accounts for all of them. They must be kept up to date on all the latest updates in the billing and coding world, and must have an incredible attention to detail. Practice managers oversee nearly all other departments in a private clinic. From the front office receptionist, to the back office billing and coders, the practice manager ensures that all employees are properly trained, have all the necessary tools to complete their jobs, and keep patients and staff satisfied.This specialized position requires a bachelor’s degree, typically in healthcare management, and years of experience in a medical office. A family nurse practitioner is an incredibly important and highly specialized position. Nurse practitioners perform many of the same duties as physicians themselves, acting as primary care physicians, prescribing or altering medication, and working with patients to support healthy lifestyle changes. Nurse practitioners are required to complete a considerable amount of schooling, and generally work as registered nurses for a time before obtaining a postgraduate degree. This schooling may also include an internship or residency, depending on the program requirements.Whatever your desired career in healthcare, you’ve taken the first step to achieving your goal with your experience as a medical office assistant! With hard work and a little bit of training, the opportunities are endless! When you’re searching for the right school for your medical assistant training and education, it’s important to carefully consider your options and choose the right program. Although there are many degree and certificate programs in the Phoenix area, your career success will depend largely on choosing one that provides quality, professional-level education. Though Arizona schools and programs are not necessarily difficult to find, medical assistant programs can vary widely when it comes to your experience as a student. First and foremost, you should make sure that any school you’re considering is accredited. When a school successfully passes through the accreditation process, it demonstrates the quality of their educational material, teachers, and overall program. As a potential student, you can request a one-on-one meeting or conversation with an enrollment advisor. This is an excellent time to ask any questions you have about the school and its medical assisting program, including specifics about class schedules, teachers, hands-on experience, and more. An enrollment advisor can help you weigh your options between a degree or certificate, learn about specific career paths, and more. Be sure to take notes so that you are able to refer back on the information later as needed. Different schools may structure their programs differently, which could affect your future career path. Consider the specific training offered by the school you are thinking about and whether it is in line with the type of medical assistant you’d like to be. If you’re planning on becoming a Certified Medical Assistant, you’ll need to pass the CMA Exam. Ask for more information about how the school helps students prepare for the exam and what percentage of students successfully pass the CMA exam. This can give you some idea of the program’s quality. Quality training is important, but so is career assistance. A good school should not only offer a solid education, but also support services for students who are moving on to their career post-graduation. These support services might include resume writing, interview training, student internships, or other ways to prepare for your future career. If you’re ready to take the first steps towards your career as a medical assistant in Phoenix, The Allen School has the hands-on training you need. Our medical assistant programs offer education and experience in both theory and clinical skills, preparing you to be an excellent candidate for the job of your dreams after graduation. Plus, our Career Services Team is here to help you reach your full career potential by assisting with interview training, internships, and more. For a high-quality medical assistant school in Phoenix, look no further than The Allen School. Contact us to start the enrollment process at our Phoenix campus today! Medical assistants play a vital role in the healthcare field, working alongside healthcare providers to ensure patients receive the high-quality care they need. There are several different types of medical assistants, each one filling an important place and assisting with tasks such as patient care, administrative responsibilities, clinical procedures, and more.When you choose a career in healthcare, every day holds the potential to improve the lives and health of your patients. As a medical assistant, your work can look very different, depending on the specific job path you choose. Deciding what comes after medical assistant training is entirely up to you – with so many options, you can pick a path that fits your interests and career goals. All medical assistants share a common mission: to keep their office or clinic running smoothly. As a medical assistant, your duties will be delegated by the primary healthcare provider or supervisor and will serve the purpose of supporting the physician in providing excellent patient care. Your specific duties will depend on the type of medical assisting job you choose, as well as the size of the practice.There are three primary types of medical assistants: administrative, clinical, and specialized. Within these three types, specific tasks and responsibilities can vary considerably depending upon the practice, physician, and support staff. An administrative medical assistant typically works closely other office administrators to schedule appointments, manage billing, and maintain patient records. Tasks may include a variety of clerical duties, including submitting insurance claims, scheduling hospital admissions and medical testing, processing payments, and general bookkeeping. Administrative medical assistants may also help with patient care, such as taking vital signs. Clinical medical assistants are responsible for many patient care tasks, with duties that are shaped by the specific laws in the state where they work. As a clinical medical assistant, your day-to-day will be a mix of clinical and clerical duties. You might record medical histories, prepare patients for their appointment, and educate patients on home care and medical procedures. Additionally, regular tasks can include requesting prescriptions, collecting and transporting lab specimens, and organizing patient records. Depending on your training and skills, you may also be expected to draw blood, perform an EKG, take vital signs, and dress wounds. A specialized medical assistant has achieved a higher level of training specific to a certain medical field, such as optometry. Completing specialized training can offer you the opportunity to work in a field that you are particularly interested in, assisting physicians and providing patient care. Some medical assistants choose to pursue a specialized career as a medical lab assistant, which focuses on testing specimens in a lab environment. There are a wide variety of fields to consider, so you can choose one that best fits your interests. If you’re interested in pursuing a career as a medical assistant, your first step is to enroll in a training program that provides real-world experience and a well-rounded curriculum. No matter what type of medical assistant you would like to be, a strong education will help set you apart from other candidates and support you in achieving your career dreams.The Medical Assistant Training Program at The Allen School of Health Sciences can prepare you the healthcare career you want and give you the skills and knowledge you need to begin work as a medical assistant. Our Career Services Team will help you choose the medical assistant career path that best fits your interests, and make sure you have everything you need to be well-prepared for your new career.To learn more about a career in medical assisting, contact The Allen School today! Everyone learns in different ways. It’s important as a student that you know the learning style that works best for you to get the most out of your educational experience at the Allen School. We strive to teach in many different ways to accommodate every one so they can be successful in their new careers. Determine your style – You need to know how you learn best. Are you a reader or a listener? Do you learn better when someone explains the steps to you or do you learn by doing? Do you learn visually, by seeing something explained or demonstrated? Once you understand how you learn best you can start to look for ways to use that style to your advantage. Use your style – If you are a visual learner this may mean taking notes during lectures. If you do better listening, you may want to ask your instructor if you can record lectures to listen to again later. If you learn better through explanation it may help to break down complex material into lists or flashcards. Your instructors will use many methods to teach you throughout your education so you will get a chance to see material delivered in several different methods. Explore new styles – The great thing about a career in healthcare is that you will have new opportunities every day to learn new skillsets and grow in your profession. It is a good idea to develop different learning styles while you are in school to help you adapt out in the field. If you notice a classmate has a very different learning style from you be sure to ask them about it. You may find a great new way to make your learning even more rewarding. No matter what your learning style is the Allen School works hard to make your time with us rewarding. We strive to see every student succeed in the workplace. Our instructors and support staff know what it takes to help you gain the skills you need to start a career in healthcare. If you are ready to start on the path to your new career today call us at 877-591-8753 or visit our website at www.allenschool.edu today. Our first classes of 2019 are enrolling now. As 2018 draws to a close and we look forward to 2019 many of us will start thinking about New Year’s resolutions. The New Year is the perfect time to set goals and start working towards a better life for you and your family. Today we take a look at the top resolutions people set for themselves in 2018. Many of these resolutions have one thing in common; they help you become a better and more successful person. Why not put all these goals together into one thing that can not only improve your life right now, but for years to come. The New Year is the perfect time to start working on your education. It’s the one gift you can give yourself that no one can ever take away from you.There’s still time to start working on a better YOU in 2019. We have a few seats left in our January classes. Remember the Allen School of Health Sciences has decades of experience helping students just like you start on the path to a great new career in healthcare. We have many resources in place to help you succeed both in your training program and beyond! So what are you waiting for? Give us a call today to get started: 877-591-8753 or visit our website at www.allenschool.edu.